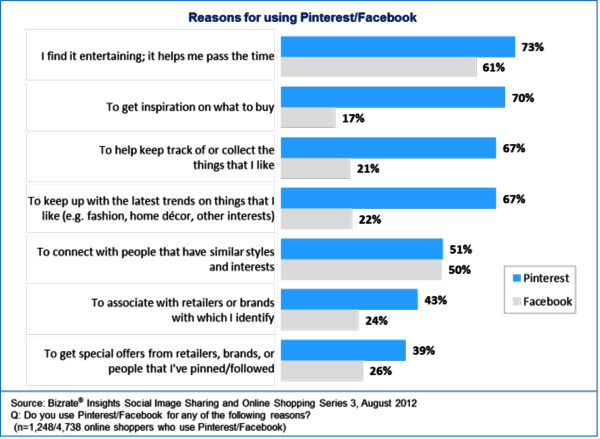 The interest in Pinterest is growing rapidly and should be part of your social media marketing and branding strategy. Pinterest is the third most visited social media site, after Facebook and Twitter, according to an Experian Marketing Services report released in April 2012. Its popularity is increasing rapidly; a year ago, Pinterest was the 188th most visited site. This translates to over 21 million visits per week. Pinterest users are more active than users on other sites; users spend 58.8 minutes on average at each visit while only spend 12.1 minutes per visit on Facebook according to SearchEnginePeople.com. Pinterest isn't just attracting visitors. It is coming in to play in purchase decisions and is considerably more influential than Facebook. A study conducted by BizRate Insights found that consumers were far more likely to visit Pinterest to get inspiration on what to buy, to connect with retailers and brands and to keep up with trends. 69% of Pinterest users who shop online report they found an item they wanted to purchase or did purchase while only 40% of Facebook users report the same. The only measure on which Facebook was equal to Pinterest was in connecting with others who share interests. The interest in Pinterest is growing rapidly and should be part of your social media marketing and branding strategy. Not only do people use social media to get inspired, they also use it to crow. According to The Social Skinny's September report, 55% of consumers share their purchases on a social media site like Facebook, Twitter or Pinterest. But Pinterest users are more likely to buy something they see on the site; 59% report purchasing something that was pinned while only 33% of Facebook users report buying something shared by a friend or in their news feed. And 79% of Pinterest users report being more likely to purchase items they've seen on Pinterest. Link your Facebook and Twitter accounts to your Pinterest account. Your Facebook timeline will show any new pins you create. You can also promote your pins on Facebook and Twitter once you have pinned them. Use the code available on the Pinterest site to add a "Pin it" button to your website. This will make it easy for your website viewers to pin images on your site to their pages. Include a link to your site in the description of any image you pin. The links generated by Pinterest are nofollow, meaning that search engines are told not to "see" the link. A link in the description is dofollow and the search engines will see it. The link will also give someone viewing the image a quick way to get to your site. Include keywords in your description as well. Since your keywords should reflect what is contained on your site, it shouldn't be too hard to incorporate them into the descriptions of your images. Don't limit yourself to pictures. Graphics and charts that illustrate something in an interesting way make great pins. You already should have images on your site that showcase what you sell or offer, so get pinning! You can attract new people to your site, inspire sales and improve your SEO. Ridge Marketing is an agency that specializes in crafting creative digital assets and using websites, search, advertising and email to ensure that the right prospects interact with your brand and become loyal customers. © 2019 Ridge Marketing & Design, LLC. All rights reserved.